A couple of years back, Bruce Springsteen wrote a note for a couple of kids who were out late at one of his concerts so they didn't have to go to school the next day. 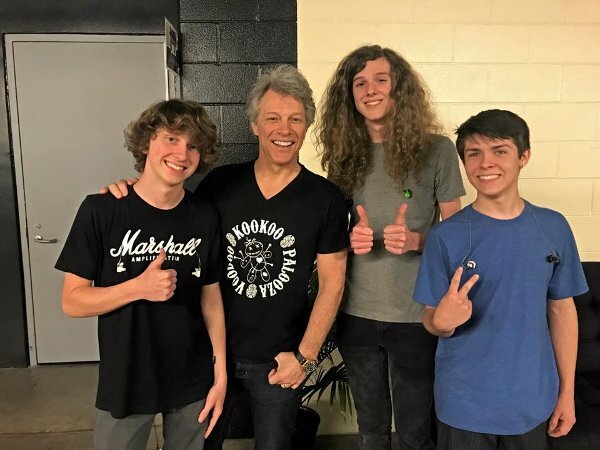 Jon Bon Jovi went one better this week, writing a letter to a high school band's school so that they could open for him at American Airlines Arena in Dallas. The Contaigous are out of Montgomery, TX and are made up of Mac Johnson on guitar and vocals, Cayden Diebold on bass and Jake Douglas on drums, "all sophomore honors, AP students making straight A's" according to their bio. While there is no solid information on how they got the treasured spot on the bill, Bon Jovi has held contests in a number of cities since 2006 to find bands to open their shows. Jon said "Every great band starts small and builds their rep one show at a time. That's the opportunity we were given and now we want to pay it forward. If you're ready for the arena stage, submit your audition tapes and join us in playing for the best audiences in rock music." On March 16, the Contagious announced they would be opening the March 26 concert but, being a Monday night, it meant that the three members of the band would have to miss school for little things like sound checks. It was Jon Bon Jovi to the rescue as he wrote a note on the band's letterhead asking that the three teens be excused for the day.